Manzanita’s oceanfront Ocean Inn took a major step recently to help their guests be prepared to respond to an emergency. Owners Janice and Larry Zagata put emergency GoBags in each of the inn’s 10 rooms, and they may be the first on the coast to do so. Their next step was to talk over the idea with Jason Johnson, owner of Tonquin Trading Company, a hiking gear and apparel company located in Seaside. In addition to outfitting people for the outdoor life, Johnson said Tonquin sees providing for emergency preparedness as part of the company’s efforts to help build up a community’s resilience. “You set your community up for success and in turn they can help with the recovery,” he said recently, while taping a video about the GoBags at the Ocean Inn. The Zagatas added a laminated card to each bag, with information on what to do during and after an earthquake, and a simple map showing the way to higher ground. The bags hang in the closet of each room. 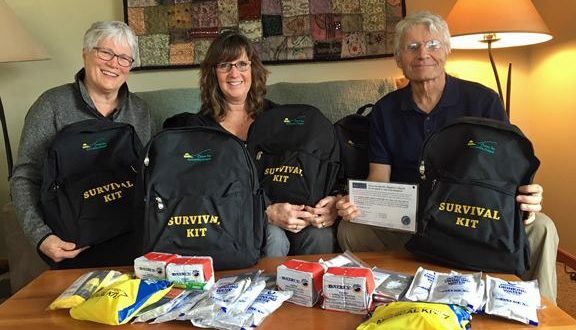 Linda Cook, who teaches GoBag classes for the EVCNB, said as far as the organization knows, the Ocean Inn is the first lodging establishment on the Oregon coast to provide GoBags for their guests.